MOEMS and Miniaturized Systems XIII, 89770O (March 2014). 1Fraunhofer Institute for Photonic Microsystems (IPMS), Maria-Reiche-Str. 2, D-011 09 Dresden, Germany. 2Micronic Mydata AB, Nytorpsvägen 9, SE-183 03 Täby, Sweden. Fraunhofer IPMS has developed a one-dimensional high-speed spatial light modulator in cooperation with Micronic Mydata AB. This SLM is the core element of the Swedish company's new LDI 5sp series of Laser-Direct-Imaging systems optimized for processing of advanced substrates for semiconductor packaging. This paper reports on design, technology, characterization and application results of the new SLM. With a resolution of 8192 pixels that can be modulated in the MHz range and the capability to generate intensity gray-levels instantly without time multiplexing, the SLM is applicable also in many other fields, wherever modulation of ultraviolet light needs to be combined with high throughput and high precision. Figure 3. SEM image of tilt mirrors. 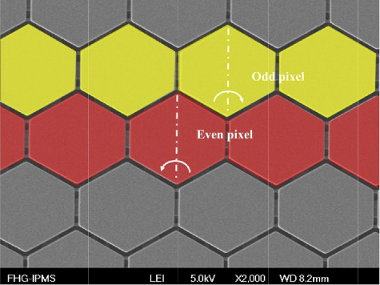 Colors indicate mirrors belonging to same logical pixel within the hexagonal grid.